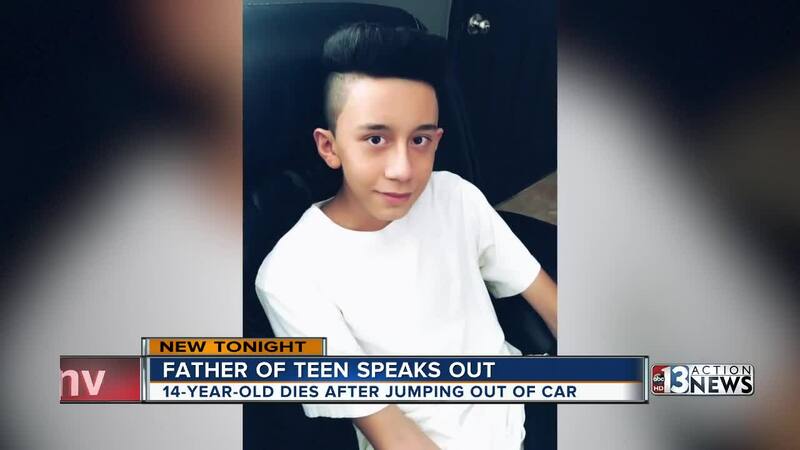 A Las Vegas man says the possibility of him being deported caused his 14-year-old son to jump out of a moving vehicle, leading to his death. A Las Vegas man says the possibility of him being deported caused his 14-year-old son to jump out of a moving vehicle , leading to his death. Reporters for Scripps station KTNV in Las Vegas spoke to Ezequiel Anorve from behind bars at the Clark County Detention Center on Thursday night. Anorve, an undocumented immigrant, has been in jail since Aug. 17 on a felony charge of battery with a deadly weapon. He's currently being kept on an immigration hold. Anvorve's family visited him in jail between 8 and 9 p.m. on Aug. 20. During that time, Anorve told his wife two sons that he may be deported to Mexico. Anorve's older son also ran across a few lanes of traffic to try and save his little brother, according to Anorve, but it was too late. Anorve says the stress surrounding his possible deportation led Silas to jump out of the car, taking his own life. "This is just a message from God, to show the world, not just Nevada, not just the United States, to show the world, how America is hurting and breaking families apart," Anorve said. Anorve is hoping to make it to his son's funeral next week but doesn't know if he will be allowed to attend.